Doctor Strange introduces the MARVEL cinematic universe to magic through Dr. Stephen Strange (Benedict Cumberbatch) an arrogant brain surgeon who becomes "the sorcerer supreme." The general premise of Doctor Strange is summed up by one of the film’s characters, Wong (Benedict Wong), who observes, "While heroes like the Avengers protect the world from physical dangers, we sorcerers safeguard it against more mystical threats." The story revolves around Strange, the stereotypical brash medical doctor who thinks himself superior to practically everyone he meets. Near the beginning of the film we see him dressed to the nines, disregarding the laws of the road, speeding in the rain, while texting in his fancy sports car. This results in an accident where he narrowly survives but loses the use of his hands which he needs for his work as a brain surgeon. Struggling with the consequences of his actions and frantically trying to reverse the damage to his hands through expensive and experimental science, Strange finds himself out of money and out of friends. Desperate and willing to try anything, he hears a rumour about a man who was healed from a crippling condition. To see if the rumour is true Strange tracks down Jonathan Pangborn (Benjamin Bratt) who claims his recovery was the result of magic learned in Nepal in a mysterious place called Kamar-Taj. What follows is an “origin story” in which Strange moves from a worldview focused on strict materialism to an expanded worldview that includes things like multiple universes, time paradoxes, mystical inter-dimensional beings, enchanted objects, astral projection, magical spells and the like. It isn't just that his worldview changes, he is literally ushered into a world in which these things are commonplace. Against his better judgment, yet still holding out hope for his crippled hands, the overachiever Strange becomes an apprentice to the Ancient One (Tilda Swinton) and finds himself embroiled in a war against a god-like being, Dormammu from the Dark Dimension, and his follower Kaecilius (Mads Mikkelsen). First, what should Christians think about the magic in Doctor Strange? Visually it owes a debt to the Harry Potter films but director Scott Derrickson adds his own touch combining it with origami-like movement strongly referencing the dream sequences of Christopher Nolan's film Inception(2010) thereby producing a dazzling kaleidoscope further enhanced by 3D. The film’s psychedelic visual representations of magical spells are not rooted exclusively in imaginary magic but in the ritual and spiritual world of Hinduism and Buddhism. This is a departure for the recent MARVEL films which have been operating under the Arthur C. Clark, "Any sufficiently advanced technology is indistinguishable from magic" school of thought. Ultimately the magic of Doctor Strange while repeatable and reliable is not explained away as technology or science if anything the film suggests that modern science may actually be akin to magic. 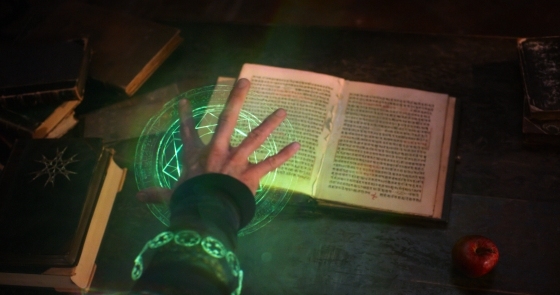 The books used to study magic in Doctor Strange are not all fictional. Some, like The Key of Solomon an Italian renaissance book of magic falsely attributed to the Bible’s King Solomon, are available at the local library or online. Derrickson actively blurs the lines between the fictional and the tangible. And here Christians may want to take pause—not because drawing mandalas or studying books claiming to teach magic will produce the magic seen in this film, but because it opens the doorway to a spiritual cul–de–sac, a dead end. If faith is placed in such things alongside of, or over and above Christ Jesus, spiritual peril sets in. Viewers will also want to keep things in perspective. Pouring over every detail of the Tibetan Book of The Dead and trying to incorporate it into the Christian faith or, heaven forbid, abandoning Christ in favour of Eastern mysticism or some kind of occult knowledge is not the same as kids waving sticks around like lightsabres in the back yard imagining their sticks are magic wands shooting spells like phaser beams. 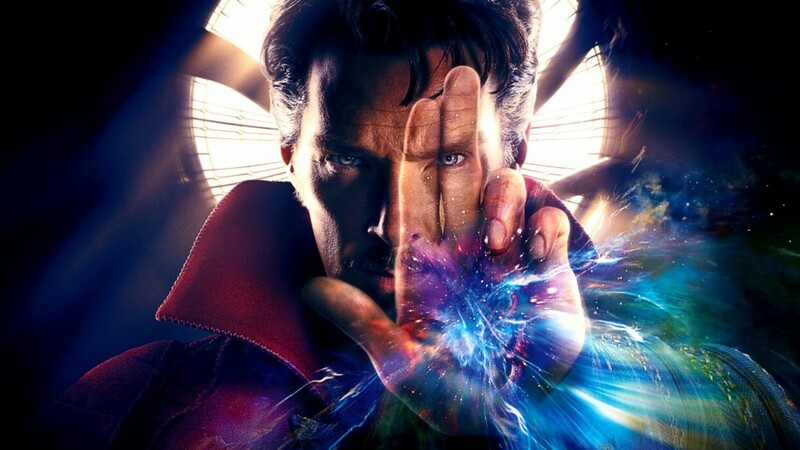 While film and TV shows like Star Trek inspire people to go into the sciences will Doctor Strange cause a widespread fascination with the occult and mysticism? Not likely; most people will look at it as a souped-up Harry Potter film set in the MARVEL universe complete with a sort of Hogwarts-style school of learning with libraries full of mysterious books. That said, the potential for a viewer to be enticed down one of the rabbit holes provided in the film, however unlikely, is there. For that reason it's good for Christians to remember that both the Old and New Testaments of Holy Scripture warn against, and condemn, the practice of sorcery (Deuteronomy 18:10 and Galatians 5:20). This is ultimately because Christ is not found in such things and the pursuit of ritual magic and sorcery leads a practitioner away from Jesus. “Enter by the narrow gate” Jesus says. “For the gate is wide and the way is easy that leads to destruction, and those who enter by it are many. For the gate is narrow and the way is hard that leads to life, and those who find it are few" (Matthew 7:13-14). Jesus is that narrow gate—the "keyhole" through which the Christian looks; the "keyhole" Christians pass through into eternal life. Elsewhere in Scripture Jesus says of Himself, "I am the door. If anyone enters by Me, he will be saved and will go in and out and find pasture" (John 10:9 ESV). Ritual magic and sorcery are found on the wide path not the narrow gate. If a viewer were looking for a spiritual path in life, what kind of path does Doctor Strange provide? The Ancient One:You're a man looking at the world through a keyhole. You've spent your whole life trying to widen that keyhole. To see more. To know more. And now on hearing that it can be widened, in ways you can't imagine, you reject the possibility. Dr. Stephen Strange:No, I reject it because I do not believe in fairy tales about chakras or energy or the power of belief. There is no such thing as spirit! We are made of matter and nothing more. We're just another tiny, momentary speck in an indifferent universe. Is the path presented to Strange important when thinking about Derrickson's film? As a materialist, Strange relies on what can be learned from observation and experimentation and at no point does he abandon this. He simply expands his knowledge based on new information. While studying with the Ancient One, Strange believes in magic because he observes it and puts it to the test. He has no more faith in the magic he's experiencing than he would in a scalpel or surgical steel forceps. Since magic is presented in this way mastery over it is dependent on an individual’s skill, knowledge, and ability to perform the rituals in the right way. Failure to do so results in failure of the magic. In the film the sorcerer is saved based on his ability not on something external. This becomes even more important in Doctor Strange because as Strange moves from being a brilliant surgeon to becoming the "the sorcerer supreme," his change is not an advancement of his character but rather a parallel move. Viewers are left with the impression that if Strange had decided to be a world-class MIT physicist or a Nobel Prize-winning poet all he would need to do is apply himself and study hard. Thus, apart from a couple apologies, he ends the movie where he started—a largely unlikable arrogant jerk. He likewise remains a materialist, it's only his conception and acceptance of what is materially possible that changes. In the end Strange requires no enduring faith, or even lasting humility, to become "the sorcerer supreme." In other MARVEL movies, the central characters move away from arrogance to discover humility as was the case with Thor (2011) starring Chris Hemsworth as Thor. And while it takes several films for the character of Tony Stark to get to a place of humility, there is still something charming about Robert Downey Jr.'s Stark even in the firstIron Man (2010) film. Cumberbatch's Strange doesn't have that charm and certainly doesn't have the sort of likability Paul Rudd brought to the character of Scott Lang in Ant-Man (2015). Strange also lacks the vulnerability of characters like Dr. Bruce Banner's Incredible Hulk (Mark Ruffalo) in the recent Avengers films. In the end, Dr. Stephen Strange is a character who may come off better in an ensemble cast where he can be the foil to more virtuous characters. As it is, he's a uniquely self-reliant character who, for the most part, isn't yearning for any sort of external salvation or help. In a film chockfull of fantastical Eastern religious imagery how does Christianity fare? One of the most obvious moments of Christian imagery is when Kaecilius and his follower stand in front of the altar of the neo-gothic Exeter College chapel in Oxford England and open a portal to the Dark Dimension, the abode of the god-like villain Dormammu. This visually links the henchmen of Dormammu to a Christian church (like in so many movies where the villain is seen wearing a Christian cross). The central reason given for trying to stop the villain Dormammu is because he wants to give everyone on earth eternal life. Does this ring a bell? While the eternal life Dormammu offers is a mindless bland caricature of the eternal life promised by Jesus the Christian will want to remember what Jesus says of Himself, "I am the resurrection and the life. Whoever believes in Me, though he die, yet shall he live, and everyone who lives and believes in Me shall never die” (John 11:25-26). Eternal life in Doctor Strange is seen as a bad thing; Christians don't look at the promise of eternal life as a bad thing. Another important element of the film is its approach to death. While the Ancient One, Strange's ultimate teacher, is not completely prepared for the nothingness she believes follows death, she still says, "Death is what gives life meaning." This is an interesting statement coming from a character who sees her impending death as an absolute. The way Christians, who confess a bodily resurrection from the death and an eternal life with Christ Jesus, look at death is very different and, with their belief in reincarnation, Hindus and Buddhist would also find this materialistic approach to life and death hard to swallow. The movie wants to have things both ways. On the one hand brimming with Eastern mysticism and spirituality then on the other hand Derrickson quickly whitewashes it all with the materialism of western atheism. The result is a sort of kitchen junk drawer of theological, spiritual, religious and occult ideas which is hard to follow or keep straight. Mature audiences who can set the mystical mash-up aside will be dazzled by the special effects if not by the film’s hero who seems stuck in neutral. For those keeping track of the bigger picture, by introducing yet another one of the infinity stones Doctor Strange advances the larger MARVEL story towards the release of Avengers: Infinity War (2018). As MARVEL releases more and more films they become less and less easy for casual viewers to enjoy because they demand a lot from the audience in terms of understanding the various backstories. Big fans with a lot invested in the characters and the MARVEL brand will get the most out ofDoctor Strange.